Welcome back to Semester 2! I hope you all have a wonderful break and are ready to start the second semester energised and refreshed. We have had a very busy time over the four week break moving into the new school building here at the Bullocky Point Education Precinct site. Last week on 5th August we had our official opening. It was a wonderful celebration and you can read and see more about this fantastic event further on in this edition of the newsletter. This term will be busy with two Residential School Programs. One in Week 5 for our eligible Year 10 and Stage 1 students and then in week 7 we will be holding a Completers Residential for our eligible Stage 2 students to assist them with the final components of their subjects in the lead up to the end of the year. We look forward to welcoming those who are attending to the new school site for our first Residential Programs in the new building. If any families are visiting Darwin and would like to come and visit our new home please feel free to do so. We are collocated on the grounds of Darwin High School on Atkins Drive, The Gardens. This edition of our newsletter contains lots of information that I hope you will find both interesting and useful. Happy Reading. 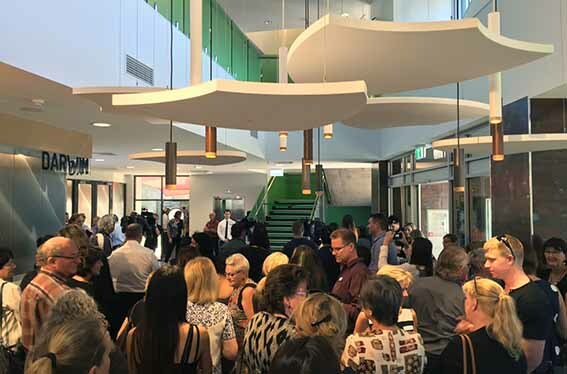 On 5 August 2016, our new building was officially opened by The Honourable Peter Chandler, MLA, Minister for Education and Mr Sean Kildare, Darwin Manger INPEX. The event took place in the foyer where two NTSDE students, Joel Kennaway and Kezia Dilettoso were MCs. The building was officially opened when the ribbon was cut on the stairs and the two plaques to commemorate the occasion were unveiled. After the ceremony, The Minister and Mr Kildare were invited to participate in an IDL lesson and tour the building. Do you know an inspirational and dedicated teacher? Show your appreciation by nominating them for a 2016 Teaching in the Territory Excellence Award! All parents and guardians, teachers and students are encouraged to have their say about their school community by participating in the 2016 School Survey. The survey, open from Monday 15 August to Friday 2 September, allows your school to gain an understanding of what you think about the school. The results will help inform future planning and drive improvement to your school. The school survey is relatively simple and easy and will take approximately 10 - 15 minutes to complete. The survey can be conducted online or you can request a printed version from the school. You will receive an email invitation with a link to the survey questions in the week commencing 15th August. The results of the survey will help inform your school about your experiences and provide valuable information about what it is doing well and where it can improve.